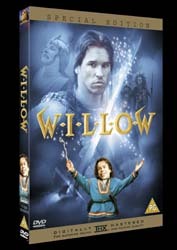 At long last Willow makes its DVD debut and what a fine disc 20th Century Fox have given us. Possibly the first blockbuster movie that featured a short person (Warwick is 3'4") in the lead role. A brave move for a movie maker and a bolder move in helping to show Hollywood that not all action movies have to have a 6'4" Adonis as their lead character. No, a 3'4" will do just as well, and he does. This movie was the first to use the morphing digital effects which has gone on to be a stable part of any sci-fi movie or TV show. But forget the movie - we have all seen it a thousand times anyway. What is great about this DVD is the impressive array of extras. By far the best of these is Warwick's commentary. It is obvious that he loves talking about his time on the movie and he fills almost every minute with interesting and amusing anecdotes that make this one of the best commentaries I have seen in a long time (if you ignore his corny jokes). He also picks the movie apart, which is great fun. For example, towards the end of the movie Warwick questions why it is raining inside the Queen's castle - why didn't she have a roof built? The other extras include two interesting featurettes (or three if you include the hidden Easter Egg), 60 stills from the movie and a good selection of trailers. The movie is presented in 5.1 Dolby surround sound, as well as being THX digitally re-mastered. This is still a great movie for both the young and young at heart.